Wishing all of you a very Happy & Prosperous Diwali! Glad to see it turn delectable 🙂 Here’s the recipe for you. Way too easy! a.) Use a firm surface to break the coconut shell. Now, either scrape the coconut from it’s shell or bring it out with the help of a knife. Peel off the dark brown skin (to get a more whitish burfi) or keep the skin (to get a darker colour of the burfi) and grate in a mixer/food processor. I personally like a white nariyal (coconut) burfi. b.) Simply use the grated desiccated coconut that you get in the grocery store. Peel cardamoms and crush the seeds. Keep aside. In a bowl, take warm milk with fresh scraped/grated coconut and mix well (in case of desiccated coconut, add a cup of warm milk, give a nice stir and leave it for 30-40 minutes so that the coconut softens). Heat ghee (refined butter) in a pan. Add the milk and coconut mix to it. Sauté for 2-3 minutes on low flame. Now add the condensed milk and stir continuously with a spatula. Add powdered sugar (optional) and mix well. Add crushed cardamom seeds and saffron (optional) now and continue to stir for 15-20 mins. more. The mix will start thickening slowly. Keep stirring. You will see the mixture leaving the sides of the pan and ghee (clarified butter) being released from the sides of the mixture. Grease a tray with ghee (clarified butter). Pour the mixture into it and spread evenly (1 to 1.5 inch height). Allow it to cool and then slice into pieces and serve. Thank you for bringing these wonderful treats to Angies Birthday party!!! 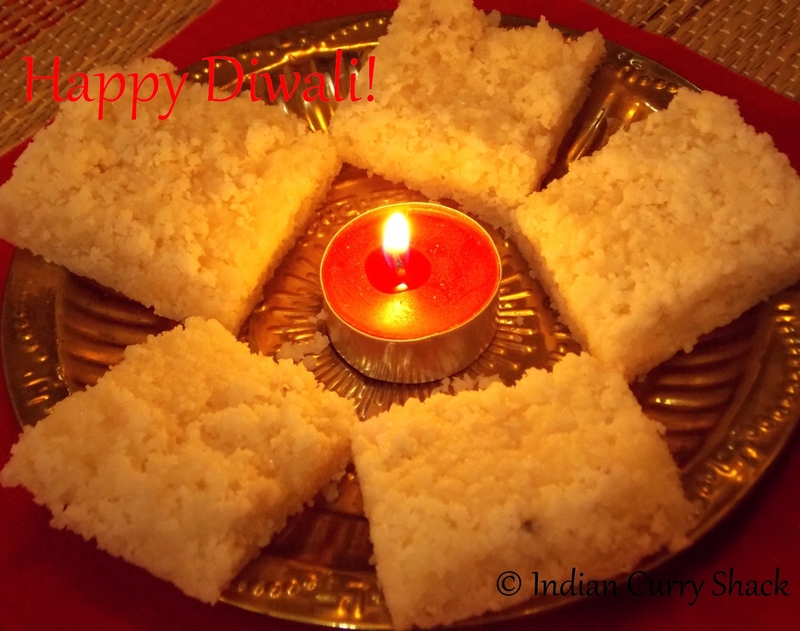 They look wonderful and are perfect for Diwali. Complete pleasure! 🙂 Glad you liked them.